Synonym: Grapsus strigosus is a synonym of this species. 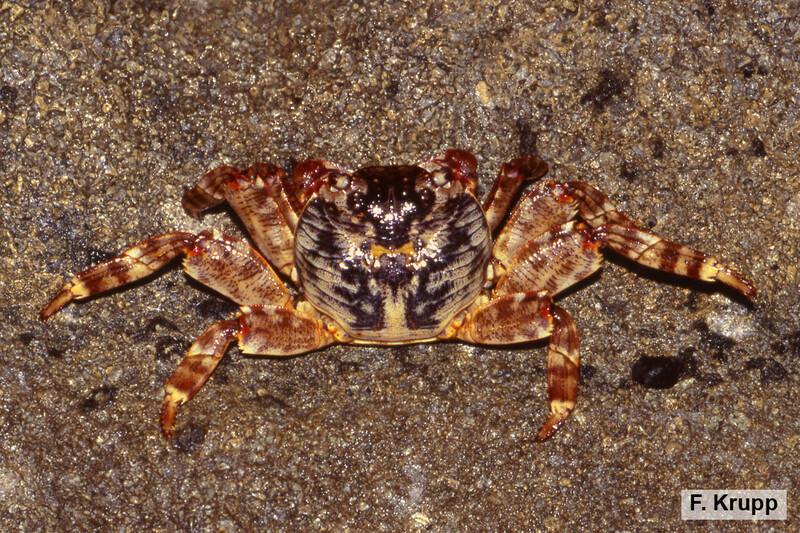 Size: Mottled Lightfoot Crabs reach carapace lengths of about 5 cm in males and 6 cm in females, with widths of 5.5 cm and 6.4 cm, respectively. Grapsus albolineatus lives along the shore in the intertidal zone, between high and low tide marks, on rocky shores and reef tops exposed to wave action, where it is a key species and present in large populations. The agile crabs are often seen running over rocks in the littoral fringe, particularly on steep shores and rocky breakwaters. They are able to survive out of the water in the splash zone by clinging close to the rock surface with their spiky legs and disc-like body, in an area where potential predators (such as fish and birds) cannot easily operate. They feed mainly by grazing on aquatic plants and detritus and are normally seen foraging on small algae, which they scrape off rocks in breaking waves, disappearing into crevices if disturbed. 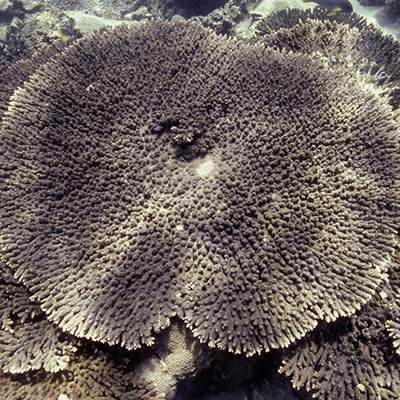 This species is distributed in the Indo-West Pacific, ranging from Madagascar along the east coast of Africa to the Gulf of Aden, throughout the Red Sea and the Arabian Gulf and further east along the coasts of the Indian subcontinent and southeast Asia to northwestern Australia, China, Japan, New Caledonia and the Hawaiian Islands. Grapsus albolineatus has not yet been assessed for the IUCN Red List of Threatened Species. Individuals are occasionally taken for bait, but collected only incidentally, usually caught by hand or with special nets, and consumed by local residents only. This relatively large-sized crab has a rounded, almost circular carapace that is slightly wider than long. Its dorsal surface is weakly convex and has a noticeable cross-striation of numerous curved or transverse ridges on the lateral regions; the ridges are short on the frontal half and get longer towards the rear margin. The anterolateral margin is armed with two teeth behind the eye orbit, which are sharply triangular and separated by a V shaped notch. A shallow groove extends obliquely from this notch towards the center of the carapace. The front is straight, gently flexed downwards, its margin very finely serrated and appearing rather smooth, and slightly wider than the posterior carapace margin. The eyes sit on the tips of short eyestalks that are wide at their base. The chelae on the first pair of legs, called chelipeds, are about equal in size and rather small in comparison to the walking legs. The four pairs of walking legs are all similar, relatively strong and flattened, with the terminal part (finger or dactylus) of each bearing rows of spines at the margins and a large spine at its tip. The basic coloration is brownish red, the carapace sometimes dark green or bluish and streaked with green and white transverse markings, whereas the legs have a mottled pattern of light red and orange, lighter on the ventral side, and the claws are reddish-brown.